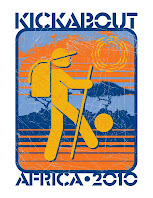 Kickabout: Africa 2010: Where's the Fair? Over the last two weeks, we have sped through Europe and only stopped for more than one night in Lyon (my dear friends) and Milan (we got tickets to the AC Milan v Inter derby from my wonderful friends at the best club in the world). In between, we’ve rumbled through famous cities, tiny villages, and everything in between. I spend most of my day driving and making arrangements for our first project visits in Syria and Jordan. But beyond the traveling and organizing, we’re spreading the Kickabout word to everyone who catches a glimpse of our decorated truck. The reactions to the decals and maps on the side of our car have strengthened our belief in this incredible journey. We get grunts, nods, smiles, furrowed brows, thumbs up and, of course, that sassy little shake of the hand that means "you're crazy". It has been that or announcements of extreme jealousy (mostly by people have traveled to Africa before). Regardless of their personal thoughts on driving across Europe, the Middle East, and Africa, EVERYONE is curious, and we hope it is this part that keeps them following Kickabout: Africa 2010. The story behind Eli’s photo: A few days ago, we were on our way to Rome and planned to reenact our “see the Leaning Tower of Pisa in less than two minutes” with some of wonderful sites in Rome. See, we really are racing to Syria! Our site-seeing plan usually involves parking the car (at insert historical place), two people get out, one stays with the car, we snap a few photos, and move on. We did an excellent casing of the Vatican, especially since no parking signs don't mean anything in Italy. Eli got us lost trying to find the Pantheon, and we accidentally found the Forum and Colosseum. The ruins we're amazing (but not as spectacular as Ostia Antica outside of Rome), and the Colosseum was so incredible that we hoofed it back to the car to get a football. After kicking the ball around in the most famous ancient sports arena in front of a not-so-colossal audience, we concluded that a ball should be taken with us whenever we explore our surroundings. We might even launch a “Where’s the Fair” geography trivia contest! This weekend, we took a ferry to Greece and darted across the beautiful and snowy landscape in a rush to get to Turkey. Our plan is to get to Syria by February 2 and kick things off with some visits to Special Olympics. Then we'll hit Jordan and visit with our Signature Partner, Right To Play. 4 comments: on "Where's the Fair?" How could Eli get you lost in Rome? You got the GPS working, didn't you? Did you kick the ball off the actual colosseum wall? Did you break a window?